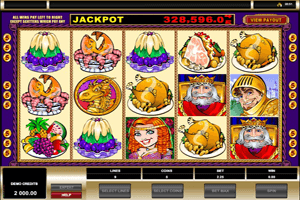 This slot machine is a 9-paylined progressive video slot machine that is themed around one of the richest kings in the medieval era, King Cashalot. He has earned his name because of his riches and fortunes that he is known for. This is why, through this Microgaming powered video slot machine, players are invited to travel back in time to the medieval time era in order to enjoy a great historic experience as they gain plenty of rewards from the fortunes of King Cashaslot. Play King Cashalot Slot here. Since the game is a progressive jackpot game, it means that once players open the game, their eyes will be drawn to the top as they see the amount of the jackpot that keeps increasing with every passing minute. This is only one of the ways through which the game can reward players. There is also a pretty great set of line payouts that players can earn as well as many special features and bonus symbols. These special symbols include the wild icon which is represented by the King Cashalot symbol. It can replace any other symbols to help players get paid. King Cashalot will do much more than just replace icons as it is the highest paying symbol, it will double payouts it helps in creating and 5 of this symbol on the on the 9th payline will enable players to trigger the progressive jackpot. There is also the scatter clown symbol and the golden dragon bonus symbol that can trigger the Treasure bonus round.